While I was away or possibly asleep the Chinese have been beavering away building space rockets and even a space station. It goes without saying that they have given their space craft silly names like the “Long March” and probably “Mao’s Delight” but amazingly considering how badly they make products for western consumption their rockets are achieving low Earth Orbit. Of course we shouldn’t encourage the Chinese by congratulating them because they might get carried away attempt to do something spectacular and actually relevant in space and not just copy the Russian and the Americans achievements from the 60’s and 70’s then over reach their abilities, which we all know are desperately limited you only have to open a newly purchased box of some electronic something or other to know that! 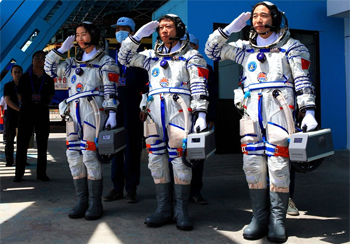 Still you have to hand it to the Chinese they are sending their Sinonauts, as they call their Astronauts, into space quite regularly and under their own power unlike the Americans sadly, but then that has more to do with the cash they have earned from the west than any other reason I suppose. All of which brings me on nicely to a picture I saw, and was touched by, this week. It’s of three brave members of the party and army (of course) one of whom had not only to be qualified and fit enough to get fired into space but also to had to be married and had a baby (guess which one). Surely these requirements are a little odd for anyone wanting to go into space aren’t they well that is what I thought. The picture that caught my attention was of the brave trio, one of whom was married and had had a baby, saluting, I don’t actually know who or possibly what they were saluting but that is not important. What I thought was important and rather touching was that the three, as you can plainly see, were allowed to take their Cats into space, safely housed in their Cat carriers for the journey. I think that the Chinese authorities have been rather nice in allowing their Sinonauts to do that and in addition I think that it is such a wonderful co-incidence that all of the Sinonauts on this mission to nowhere own Cats, although the Cat carrier of the lady Sinonaut might be adapted to carry the baby that she had to have had to qualify for the journey mighten it!